The Fender CD100 Left-Handed Acoustic Guitar is a lot of guitar for a very reasonable price. Everyone knows how difficult it is to find a good quality – and affordable – left-handed guitar. Well, Fender has come up with the solution; the CD100LH. The CD100LH is built on a dreadnought body but is strung for the left-handed player, meaning that now even southpaws can produce that rich, deep sound that makes dreadnoughts such a popular choice in guitars. And while the CD100LH does not have the richness of sound or sustain due to it having a laminated spruce top instead of a solid top, its cedar top and mahogany back and sides combined with the dreadnought body give it a big, mellow sound that will not disappoint. Some may prefer its matted “satin” finish over the high gloss finish of other models. This guitar is very light-weight, making it a good travelling gig guitar. At just ~$229, the CD100LH is a good beginner acoustic guitar for left-handed players, and will enable even left-handed players to be able to afford a well-made instrument. Once the beginning guitarist has progressed, they may want to consider upgrading to a different left-handed model. 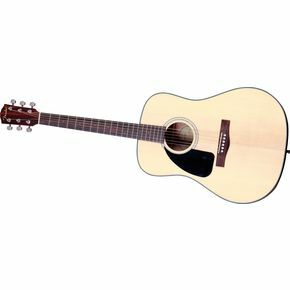 But for the beginning acoustic guitarist, the Fender CD100LH is an excellent choice. See more great guitar reviews at Fender Acoustic Guitars. Join in and write your own page! It's easy to do. How? Simply click here to return to Fender Acoustic Guitars.